Becky Decatur is a fellow parent at school and her husband Jim is our esteemed Assistant Head of the Upper School. 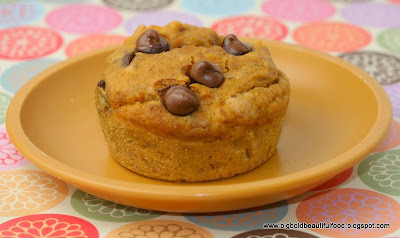 When she saw my chocolate chip muffin post, she was kind enough to send me a healthier version involving whole wheat flour, flaxseed, and pureed pumpkin. If you like moist, dense muffins that taste of fall, give these a try. I'm loving the fact pumpkin if finally coming back in season. Looking forward to all the different pumpkin recipes.